An amazing chart via McKinsey and BIS showing the distribution of financial assets by class and overall stocks of financial assets. These are covering the period through Q3 2013. Stock of financial assets might seem absurdly high compared to overall economic activity, but it is not that much out of line with longer term growth trends. Between 2000 and 2014 the world GDP is expected to grow from USD32,731.439 billion to USD76,776.008 billion, a rise of 135%. 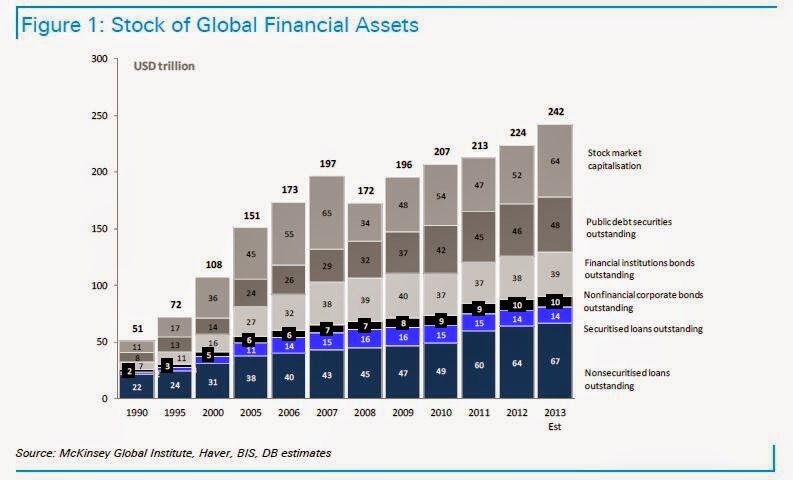 Over 2000-2013, stock of financial assets rose at least 124%. However, in composition terms, the assets are geared toward debt and especially sovereign debt. Public Debt securities are up in volumes 243% - almost double the rate of economic growth. Financial institutions bonds are up 144% - faster than economic growth. Private non-financial sectors debt is up from USD43 trillion to USD 91 trillion - a rise of 112%. Total debt is up from USD73 trillion to USD178 trillion or 144% so within debt group of assets, public debt is off the charts in growth terms. There is much deleveraging that took place in the global economy over the recent years. All of it was painful. But there is no way current levels of debt, globally, can be sustained. A couple of things stand out in the graph to me. The crash in stock markets in 2007, in stock market capitalisation in particular appears on this chart. But notice, after that, that stock markets recover again, perhaps a little bit too quickly moving towards 2013. What you will notice also, in the graph, is a sharp rise in non-securitised loans outstanding moving from 2010 to 2011 (and climbing every year after that). This is suggestive of the financing of development, or economic activity somewhere in the world, through the use of debt. I do see your point about governments issuing a lot of debt as well. Governments seem to have been highly leveraged pretty much from the mid 2000's until the present day. It is an indication that a lot of national and local governments around the world are either A) investing, or B) barely coping (given the problems present in the broader economy).